Move over toothbrushes and Lifesaver Storybook Boxes, it’s time for a new slew of edible delights to fill stockings with. Here’s a list of local, delicious stocking stuffers made in Vancouver, perfect for the food lover on your Christmas list. 1. 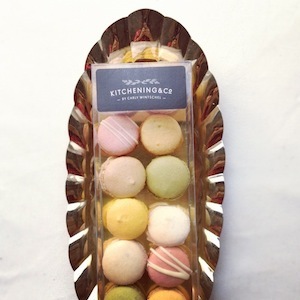 Kitchening & Co. Macarons – made by Carly Wintschel herself. She’s a local gal who trained in Paris and mastered the art of Parisian macarons. Her desserts are just the right level of ‘sweet’ and flavours really pop. 2. Pink Spatula Lump of Coal Marshmallows – Tina Bacon’s latest seasonal flavour is ‘Lump of Coal’ – vanilla marshmallow mixed with chunks of Belgian chocolate and doused in black cocoa powder. 3. Bel Cafe Ginger Shortbread – Pastry Chef Wayne Kozinko mans the dessert menu at Hawskworth (a top Vancouver restaurants) and all pastries at its posh sister cafe, Bel. This seasonal cookie is ultra rich with a ridiculously smooth texture. Where to buy: Bel Cafe, 801 W. Georgia St.
4. Beaucoup Bakery Dessert Bars – if you’re up to speed on your Vancouver bakery news, you’ve heard of this brand new, one-of-a-kind, French-inspired bakery. Jackie Ellis, owner and head pastry chef, uses only the very best ingredients – her desserts really are some of the best I’ve tried. Where to buy: Beaucoup Bakery, 2150 Fir St.
5. Stollen Bread at Yew Restaurant – an incredibly rich, dense treat I look forward to every Christmas. You won’t be able to stop eating this. 6. Cocolico Sauces & Chocolate by Wendy Boys – judge this book by its cover. Not only is Wendy’s packaging the kind we ladies covet, her creations are to die for. 7. Domenica Fiore Extra Virgin Olive Oil – the kind of oil that is so flavourful, it can stand alone as a dressing. Its easy pour spout (to prevent over-pouring) is another great feature. 8. Roaring Twenties Wine – the fun team behind Vancouver Urban Winey has launched a wine label that matches their spirit. At only $14.99, this stocking stuffer is a steal. 9. Thai House Curry Sauces – after taking a Thai cooking class at Urban Thai (a part of the Thai House family), I learned how focused the group is on authentic, natural ingredients. These sauces are a great option for in-home dining when you don’t feel like cooking another big meal. 10. Thomas Haas Chocolate Angel – this probably won’t fit into your stocking, but how about the mantle? Artists will appreciate the work that went into this hand-made chocolate sculpture – it’s dainty and perfect. 11. Cocoanymph Holiday Truffles – Chocolatier Rachel Sawatzky’s flavours always pack serious punch. Try ‘Rudolph’ (white chocolate with peppermint ganache) or ‘Dancer’ (milk chocolate egg nog ganache with rum and nutmeg). 12. Macaron Limoge Trinket Boxes – at $13, these are a perfect and entirely cute stocking stuffer or girlfriend gift. Carry it in your purse filled with mints, pills, earrings etc. Where to buy: The Cross Design, 1198 Homer St.
13. Oregano-Infused Olive Oil – if you’re into package design, you’ll love this one. It’s as beautiful as the olive oil is pure. Where to buy: Pizzeria Farina, 915 Main St.
14. Gypsy Tears Ruby Ale (aka Salted Caramel Beer) – no description needed, right ladies? Buy a case, disperse among your stockings and save one for Christmas dinner. 15. To Die For Banana Bread – can you blame me for including it? For large orders, I can offer volume discounts. Email erin at itstodiefor dot ca with inquiries. *FYI – Dirty Apron and Edible Canada’s Retail Store carry many of the above-listed items.